The ways in which research data is used and handled continue to capture public attention and are the focus of increasing interest. Electronic publishing is intrinsic to digital data management, and relevant to the fields of data mining, digital publishing and social networks, with their implications for scholarly communication, information services, e-learning, e-business and the cultural heritage sector. 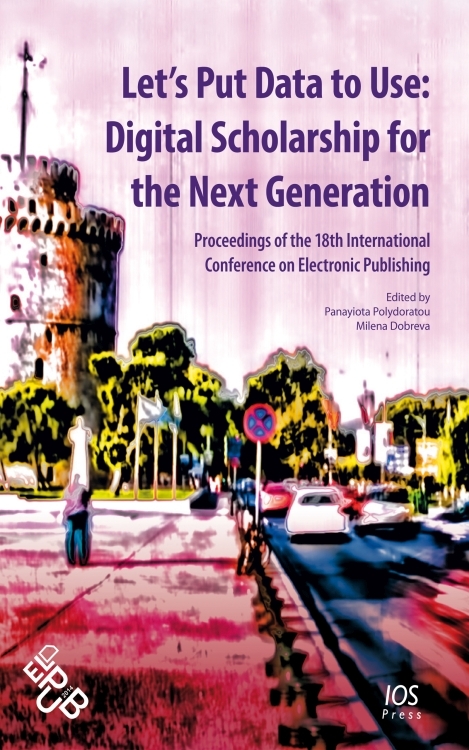 This book presents the proceedings of the 18th International Conference on Electronic Publishing (ELPUB), held in Thessaloniki, Greece, in June 2014. The conference brings together researchers and practitioners to discuss the many aspects of electronic publishing, and the theme this year is 'Let's put data to use: digital scholarship for the next generation'. As well as examining the role of cultural heritage and service organisations in the creation, accessibility, duration and long-term preservation of data, it provides a discussion forum for the appraisal, citation and licensing of research data and the new developments in reviewing, publishing and editorial technology. The book is divided into sections covering the following topics: open access and open data; knowing the users better; researchers and their needs; specialized content for researchers; publishing and access; and practical aspects of electronic publishing. Providing an overview of all that is current in the electronic publishing world, this book will be of interest to practitioners, researchers and students in information science, as well as users of electronic publishing.